These first quilts are mini quilts, generally 8 or 10 inches high. To give you a point of reference, the wooden 'pole' they are hanging from is 1cm diameter! The winning quilt was a whole cloth - again remember that the pole is 1cm!!! Wow - that really is micro quilting, isn't it? Fantastic! Glad you stopped shopping long enough to look at some quilts Benta! Makes you feel you are just a beginner! If only I had the patience (and skill!) for these. I love the black and white scene. Thanks for sharing Benta. I am with Diane on people being a bit precious, you would think they would be happy that someone liked them enough to take a photo of them! 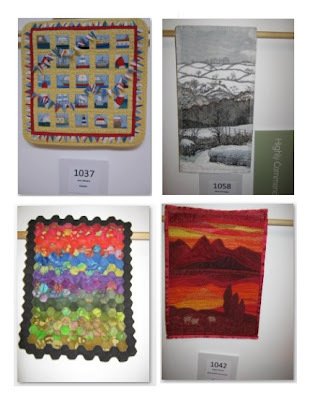 I always try to credit the creator of quilts I share on my blog (I take a photo of the label alongside - thank goodness for digital cameras) but I agree with Celtic Thistle and Diane-crewe, these quilts were displayed in public and therefore they have "left home". Like our children, we care for them and nurture them but once they're out in the world they're not ours to control any more.